Bad: Multiple things happening at the same time and only having two hands. Manual Samuel has been out since 2016 on PC, PS4 and Xbox One and has already received a lot of praise. Recently the game has been released for the Nintendo Switch and we got a chance to test this version. 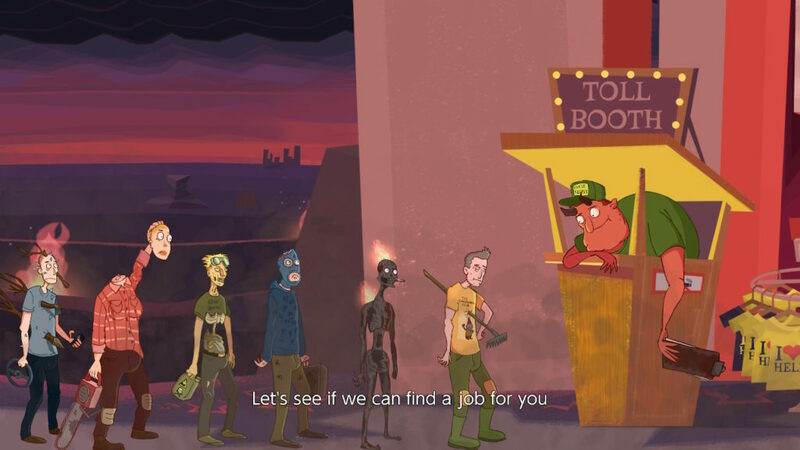 Manual Samuel has been developed by Perfectly Paranormal and Published by Curve Digital. After making a deal with Death, Samuel has to control all his bodily functions manually. He has to last for 24 hours or go back to hell. We were excited (and kind of dreading) to give living manually as Sam a try! Samuel is someone that hasn’t really worked a day in his life. He grew up a spoiled rich kid. This caused him to be somewhat of a freeloading douche. He is sitting with his girlfriend in a café drinking the fanciest coffee with an unpronounceable name. His Girlfriend is upset but he, of course, doesn’t notice and makes her even angrier. She then loses it and hits him with a glass bottle. This causes him to get a concussion. After getting up, paying the barista, he slowly makes his way outside. When he goes out he sees his girlfriend on the other side of the street. He rushes out on the street to make his way over her. However, at that moment a feces truck heads straight for him and kills him right then and there. Samuel then ends up in hell where he meets Death. Death offers him a deal in exchange for his shreds of life which are the currency in hell. Since hell makes you work like a regular person it scares the freeloading Samuel but he ends up accepting the deal. Death resurrects him and he now has to use every body-function manually such as blinking, breathing, etc. If he manages to survive for 24 hours he turns back to normal and keeps on living. However, if he fails, it is back to hell for Samuel. The story in Manual Samuel is pretty funny and pretty random sometimes. As you play the game you get to meet more characters which make the story even more entertaining. You are never really bored with the randomness. Even with it being random it still forms a coherent whole and follows a sort of “main” story of Samuel’s usual life with it now being manual. 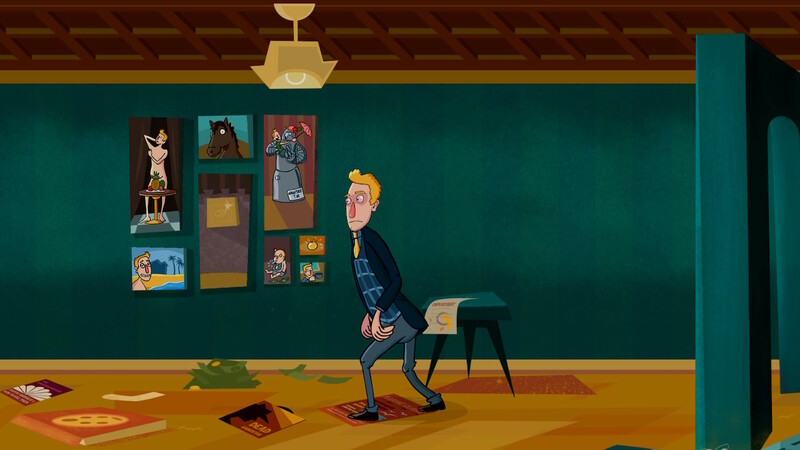 Manual Samuel has a cartoon-esque style. Everything is well designed and looks good. The backgrounds are simple but still look nice. Every new scene you go to has a different background with sometimes some hidden funny little “Easter eggs”. All the characters look different and have funny features fitting with who they are representing. Animations are smooth but also look more like some flash animations. This mostly is due to the fact that Sam’s legs and arms all move separately because you control them. 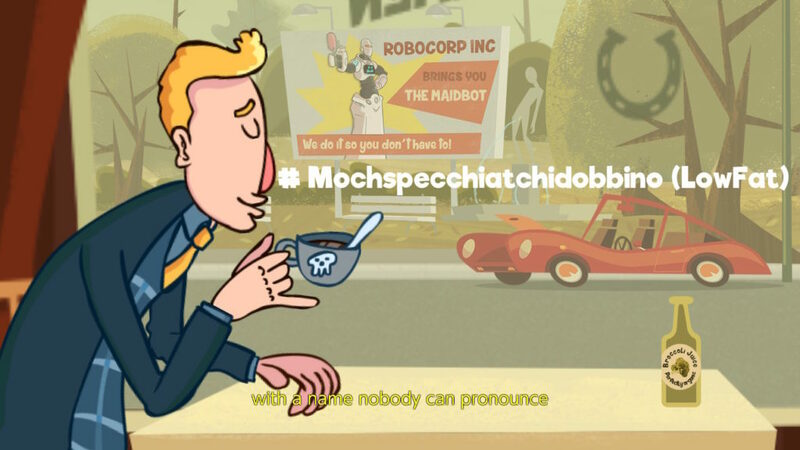 The music in Manual Samuel is mostly relaxing “everyday life” music. Even if you’re trying to do something difficult it still stays this cheerful track. Voice acting is also present in the game. Sam doesn’t really talk himself but there is a narrator that sort of talks in his place. He also makes fun of you if you fail, with sarcasm. Other voice actors did a good job portraying their character(s) and inputting emotion where it belongs. Sound effects are well done and even sometimes a bit over the top but funny. Manual Samuel is an adventure simulation indie game where you play as Samuel who is a rich spoiled man. When Samuel gives up his Shreds of life to Death he gets resurrected. However, this deal had a catch; every bodily function now has to be used manually for 24 hours. This is where you, the player, come in. Almost every button on your controller links to a bodily function of Samuel. There is a button for breathing in and another one for breathing out. The breathing out one also gets used to blow on things. Then you also got one button for the left leg and a button for the right leg. You use these to walk and if you step with the same leg twice you do a split. Which happens quite a lot if you aren’t used to walking yet or forgot which leg you used last. Next, there is also a button for each arm. Sometimes you have to use the buttons twice if you, for example, pick something up and then have to use that arm for bringing it to your mouth. Often you have to keep the arm button pressed while simultaneously pressing another button, which can get a bit harder depending on how flexible you are. Sam’s spine is also manual so it will sometimes give out. Your Joy-Con’s start to rumble to warn you if Sam’s spine is going out. Although if you’re not fast enough it will give out and make Sam bend backward or forwards. Which is a really funny sight and also easily fixed by either pushing a button or flicking a Joy-Con. It’s really amusing that they made use of the Joy-Cons that way. Each bodily function can also be used in another creative way like the previous example of the breathing out also being used to blow on things. Often you have to use your arms to pick things up like for example if you brush your teeth you need to pick up a toothbrush, hold it and then press another button quickly so you brush. 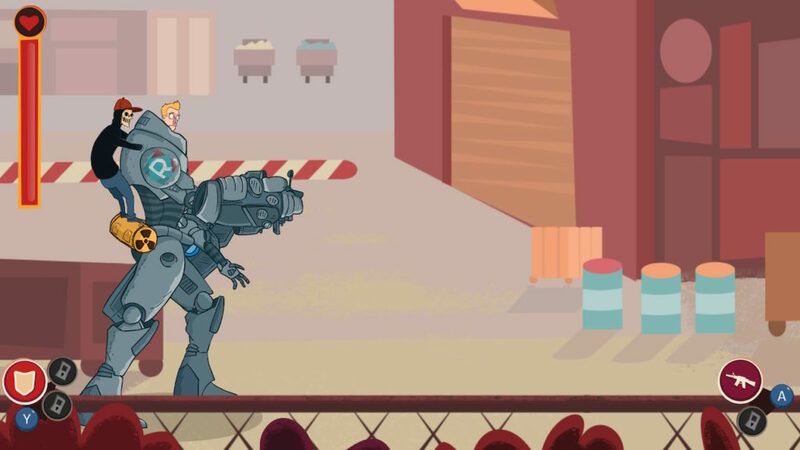 There is even a moment where you’re controlling a robot who can shoot lasers and rockets. Even if this part comes on randomly the controls are mostly the same. It makes it even more entertaining that a useless douche can now control a robot because he is cursed to live manually for 24 hours. The game is very good for showing instructions again when it is obvious that you forgot or if something new is going on. If you use the wrong leg multiple times and are wiggling on in a split it shows instructions on how to get up and walk again. Sometimes Sam will need to talk which requires you to time his letters right or he doesn’t make sense. You will often need to redo this because getting the timing right is pretty hard. There are also other moves that require you timing them like for example coughing requires you to time it as does throwing up. In Manual Samuel, you often have little tasks you need to complete but besides those tasks, you also need to keep track of the basics like breathing. If you don’t breathe in for a while you collapse of lack of Oxygen and first need to breathe in and get up before you can continue. This can get quite rage inducing if you’re trying to do a time-sensitive task and you need to breathe in, breathe out, blink and also make sure your spine doesn’t collapse as well as press the button for the task. Often you will need to re-do tasks because you might have misstepped and did a split or you collapse because you forgot to breathe. It is good that they remind you of controls pretty often or else you would be failing much more since there are so many things to remember to do. Manual Samuel is a really enjoyable but rage inducing game. The game has a funny story with a lot of sarcasm included. It’s amusing to play but recommended that if you are raging too much to put the game away and try again later. Being too rushed or too slow can cause you to be stuck even longer. 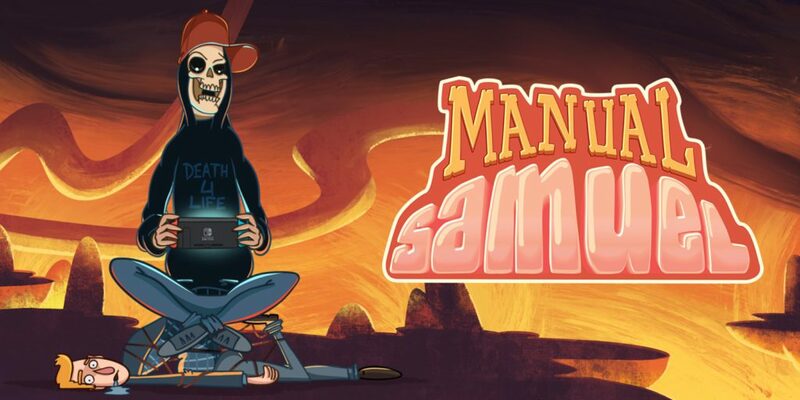 Manual Samuel is recommended for everyone that has a Switch and wants to enjoy a pleasurable game that is also challenging. The story really makes up for the rage parts so it is certainly worth it.